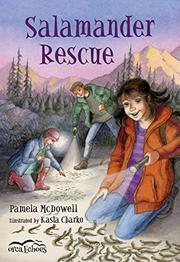 Almost–fourth-grader Cricket and her friends have a second adventure learning about, and helping, wildlife in Waterton (Ospreys in Danger, 2014). From the start, readers are immersed in Cricket’s life as the daughter of a Canadian wildlife ranger: Dad lets Cricket ride with him to the scene of a “bear jam,” a traffic snarl caused by tourists gaping at a bear. It is close to the migration time of two-toed salamanders, and Cricket learns from a scientist that the creature’s population has been shrinking. Can Cricket and her friends help? The text’s simplicity is on target for beginning readers. Throughout the 10 short chapters—each headed by a sketch of an endearing-looking salamander—didactic conversations and experiences provide facts about bears, cats, deer, orcas, and especially Alberta’s two salamander species. The information is sound, but contrasting attempts at realistic conversation and especially at humor feel forced. The black-and-white pencil art is detailed and attractive, but it confirms the characters’ lack of diversity—faces are white, even in crowd scenes. The fact that the scientist studying the two-toed salamanders is a woman is almost a blow to feminism, since it is Cricket’s brother who figures out an invention to help the struggling creatures and then Cricket and her friends who manage to raise funds for the endeavor. Still, simple, accurate descriptions of specific research methods and of salamander features shine.